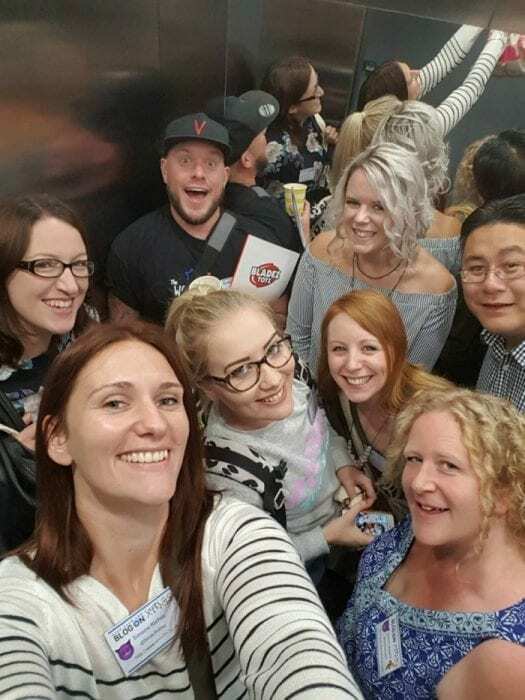 How many bloggers can you fit in a lift? The debriefing sessions from the BlogOn Xmas Conference at the weekend are in full flow and time is being spent going through the many images taken from the weekend. This image truly stood out as certainly the most awesome lift selfie ever taken… Ellen DeGeneres eat your heart out, but possibly the most fitting image from the weekend? A lift filled with near strangers, all smiling and enjoying themselves. That is what the BlogOn conferences are all about, everyone coming together and enjoying themselves, whilst networking with other bloggers and the fantastic brands in attendance… and of course learning new tricks of the trade. So, a huge thanks have to go to Sim (me), Jenny, Tim, Luke, Hannah, Alex, Yvonne, Josie, Gemma (who hid in the corner). That looks fun. Real people for a change! Nothing quite like a lift selfie… I’m yet to find one of me that I like hha! Might try this at Britmums tomorrow! Thank you sharing this with us at #TriumphantTales. I hope to see you back next week.